Social media marketing (SMM) is a set of techniques that aim at attracting traffic or attention to the brand or product via social media platforms. It is a part of the Inbound Marketing that uses social media as a channel to promote companies and solve other business problems. Social networking websites give visitors opportunity to interact with each other, create social relationships and share opinion on wide range of subjects. 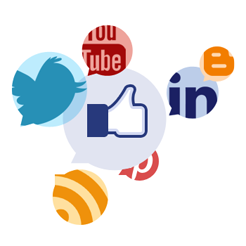 SMM’s aim is to interact with individuals and promote brand by being active on various social media platforms. On blogs you can express thoughts, ideas or share news on behalf of yourself or your business. Comment feature boosts personal communication and involvement. Microblogs (e.g. Twitter) limit number of symbols in posts and are useful for quick updates and link sharing. One short but catchy title or witty remark can pick interest and make you popular. Social networking sites are usually socially or professionally oriented, allow to establish connections among users (individuals or organizations) who have common interests, background or real-life contacts. Collaboration tools or wikis allow access to real content and are improved by community efforts. Wiki usually encourage all visitors to participate and provide more detailed or accurate information. Various content sharing sites usually involve photos (Pinterest, Flickr) or videos (Youtube). Make your brand known and popular by sharing interesting visual content. Forums unite people not on the basis of shared interests in general, but around a specific topic that needs discussion or solution in rather short time frame. Here the themes like “what to buy” and “where to buy” are usually discussed. Forums are the ground where word-of-mouth advertising takes place. Brand building and brand awareness improvement. Social media influences even businesses, who are not or do not want to get involved in it. Number of people, who immediately after visiting a new restaurant or trying new product access their social media accounts and share their impression with community, is skyrocketing. You can't guess who among your customers will improve or worsen your image. Moreover, connection between product, social media and feedback is becoming tighter. Most websites where you can sale or promote products and services integrate commenting and sharing buttons of several social media platforms on their web pages. For those, who consider SMM to be complicated, here is the list of simple basic rules you need to follow. 1. Create relevant content, not advertisements. Make sure your content is engaging and valuable for social media users. Add discounts for loyal clients and clear call-to-actions, but never stop giving free, easy-accessible and high-quality content as a reason for a great number of people to get interested. Never lose opportunity to transform bypassers into followers. 2. Conversation needs at least two participants. The basic idea of social media is dialogue. Encourage conversation, give visitors possibility to express their opinion, always reply to the comments as quickly and helpfully as possible. Be patient and professional, never reply rudely even to impoliteness or insults. Remember that it will influence your reputation, since other people will be able to see your conversation. 3. There is such thing as ‘too professional’. There is a thin brink between professional and boring, as well as between funny and absurd. People are trying to get some answers, but in social media there is a need to constantly support interest. Add personal touch, a little bit of humour and entertainment to enliven the conversation. With the diversity of social media platforms and simple process of creating an account, it is easy to get lost and tangled in the ‘web’. You can’t be everywhere. Conduct small research, find those platforms that are visited by people who will be interested in the information you can provide. There are authoritative experts in your field whose recommendations are influential across the social media. Get involved in their conversations, show your expertise, add links to their messages in your posts/tweets/blog/etc. Rapport with them will attract visitors from your sphere of interest. give option to assign admin roles for several people that will manage company page. Social media gives equal marketing opportunities to businesses of all sizes. Set achievable objectives and make your brand popular among social media users. If you don’t have time or desire to deal with everyday social media involvement, contact Quintagroup and we will ensure growing of your presence on the social networking websites.